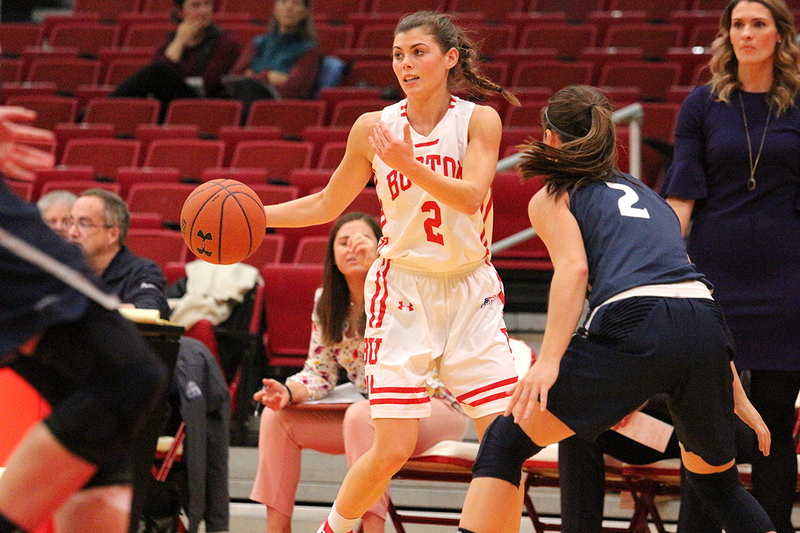 A 72-61 win over the University of Delaware kept the Boston University women’s basketball team undefeated at Case Gym in its final non-conference match at home Sunday afternoon, making it the first perfect home series outside of the Patriot League for the team since 2012. The 11-point deficit is the largest the Terriers (4-2) put up against Delaware (3-4) since 1997, dating back to when the two teams were in America East. BU head coach Marisa Moseley said she anticipated zone defense from Delaware and worked to break its guards up. The two teams traded baskets during the opening minutes, leaving the score at 10-9 with Delaware in the lead with 5:24 left on the clock. A set of three-pointers from sophomore guard Katie Nelson gave the Terriers their first lead of the game. BU remained perfect from beyond the arc through the first quarter and went into intermission with a 20-15 lead. The Terriers returned in the second quarter with a 10-2 run and finished the first half ahead 37-24 having shot at 59.3 percent from the field. This lead cushioned BU through the third quarter, during which the Blue Hens outscored the home team 15-10 and held the Terriers to shooting at only 20.0 percent. Moseley said that coming out of halftime has been a weak point for BU this season. Despite being outscored, the Terriers maintained their lead and then built upon it through the final quarter. Nelson sealed the final score of 72-61 with two free throws and ended the game leading in points with 19, while senior guard Payton Hauck earned a double-double with 11 points and 10 rebounds. The win concluded a three-game homestand. BU will start a four-game away series against Dartmouth College on Wednesday, which will conclude the team’s non-conference season. Dartmouth (2-4) is currently on a four-game losing streak after winning its first two games, including its 54-41 season opener against Patriot League foe, Loyola University Maryland. Moseley said she looks forward to seeing her team maintain its focus on the road.